CHARLES II (1630-1685). King of England, Scotland and Ireland. 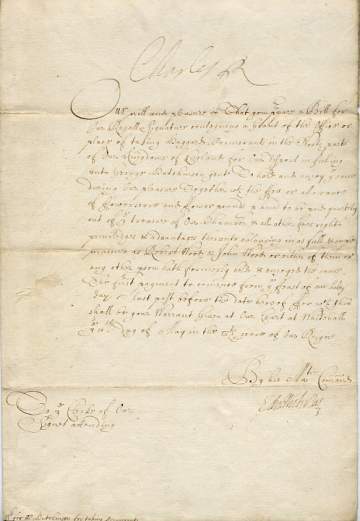 Letter Signed (Charles R' at the head) addressed to 'ye Clerke of Our Signet attending', 1 page folio, Whitehall, 10 May, 13 Charles II . With integral second leaf bearing the endorsement 'Hutchinson office of Cormorantes / done' and the date. Countersigned by Sir Edward Nicholas (1593-1669, Secretary of State). Granting the privilege of capturing cormorants for the purpose of the king's sport in fishing. The use of cormorants for catching fish or as a sport has a long history. The technique involved restricting the bird's neck so that it can swallow only small fish. When large fish are attempted they stick in the bird's throat and the fisherman can retrieve them.